Everyone loves a shortcut. Sometimes some may look at shortcuts as if they are the easy way to do things but not the correct way. There are some that may always take the easy way. Never-the-less if the short cut gets results, then one could argue that it is the correct way. I have put together a small list of short cuts they may help while painting a vehicle. There are a few things that just make us cringe when we are painting. 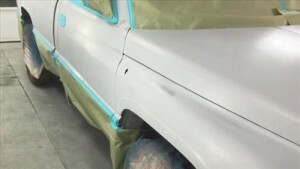 We spend a lot of time and work, sanding, and placing primer on a vehicle. So when the paint is to thin, or we just move to slow. We can make the paint run a little. When the paint runs we get frustrated because we know how much work it is to get that run back out. Well there is now a nifty little tool called a nip file that will remove that run quickly. With little work at all we can remove it and get back to painting. This handy little tool, you can keep right in your pocket. While painting if you get a run. Simply etch it out and get back to work. The second tip I would like to share. Has to do with a automotive part. It seems no matter what we do with our air hose. It always ends up sticking at the tire. We shake it, we whip it, until we realize that the only correct method is to walk back to the front of the vehicle and bend over and remove it from the tire. Then when we bend over and grab the hose, we realize we didn’t tighten the paint lid all the way. Try this easy tip. 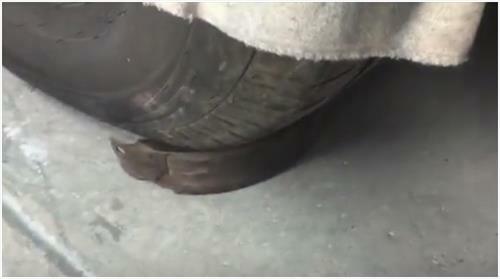 Place a pair of old brake shoes in front of both tires. The shoes will stick and not move from their location, allowing the hose to make the turn smoothly and efficiently. The third tip I would like to share, I absolutely love. Walking around the vehicle can cause you to stir up any dust and lint that is on the floor. 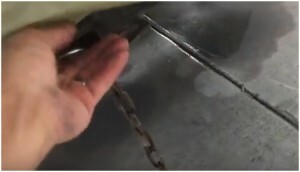 By soaking the floor with water, you keep all those particles where they belong, and the part I love is when the vehicle is done, it just takes a squeegee to clean the floor. And last but not least. This tip puzzles me on how it actually works, but I have experienced its truth myself. The lint that floats in the air while you are painting is there with or without a exhaust fan. No matter what we do to prep, there is always that one piece that lands on our beautiful paint job. If you are painting a base coat, clear coat. This is a simple fix; however it does take extra time. If you are doing a single stage, well we know there is very little forgiveness with single stage paint. I’ve been told that lint that floats in the air will attract to a vehicle because of the polarity of the lint. So if the lint is floating within one inch of the vehicle. 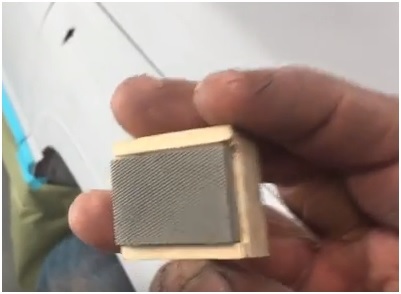 It will be magnetized in a sense, and the vehicle will pull the lint to it. If we hang a chain so that it touches the vehicle and the concrete. We reverse the polarity of the vehicle. So if the lint is within one inch of the vehicle. 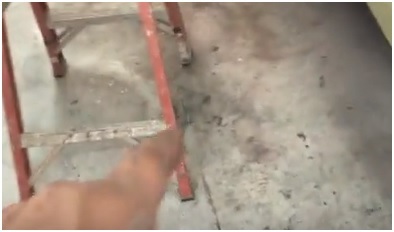 The lint will now float to the ground, instead of being pulled to our paint job. So enjoy these tricks and tips, we will continue to post more for you. I like what you said about soaking the floor with water in order to reduce the number of dust particles that enter the air when working on a car. I think that taking your car to a body shop that maintains a clean environment is the best way to go. If I were to get into a collision, I would contact an auto body shop in my area that charges a fair rate for their services. I’d heard of some of these panting tips, but the one about reversing the polarity of the car before it gets painted sounds absolutely genius. I don’t paint my car very often, but I do have a paint shop and I get out every once and a while. I’m excited to go ahead and try this next time I get out to paint. Thanks for sharing! Great advice and tips, thanks for taking the time to share.